Citizens groups began yesterday marches in two parts of the country in rejection of the re-nomination of Evo Morales and Alvaro Garcia Linera for the 2019 general elections. 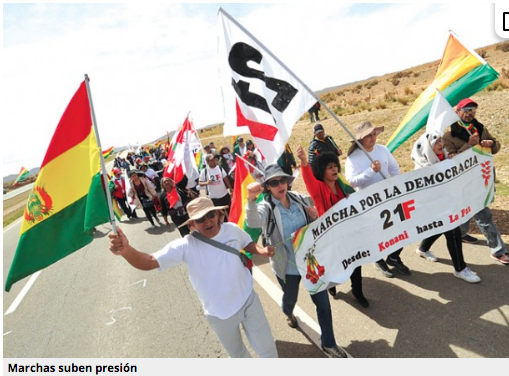 The central mobilization that brings together several groups of citizens of the country left yesterday from the Oruro village of Konani, 147 kilometers from La Paz, to march “in defense of democracy” and the respect of the results of the referendum in 2016 that denied the possibility Evo Morales to be reelected. The marchers wear white shirts, some have stamps 21F, in reference to that referendum, and flutter national flags and posters with the slogan “Bolivia said no”. It is expected that until next December 6, the march will reach the doors of the Supreme Electoral Tribunal in La Paz. “We are going to remind the members of the court that the will of thousands of Bolivians is above the whims of a few and that the popular will must be respected,” said Gabba. At the beginning of the mobilization, the president of the Permanent Assembly of Human Rights, Amparo Carvajal, thanked the marchers and asked them to walk the road “with care” and demonstrate unity when entering the cities of El Alto and La Paz. On December 8, the electoral body will define the candidates qualified for the primary [election] in the country. Another march that started in the past days from the town of Chaparina is scheduled to join a mobilization that leaves today, Sunday from Chulumani. Gabba said all the protests will be united “in a strategic point” to arrive together in La Paz. This week, the former president and presidential candidate for the Community Citizen Alliance, Carlos Mesa, sent a letter to the electoral body requesting compliance with the constitutional article that prevents the Bolivian ruler from being a candidate in this electoral process. The march has the support of entities such as the National Committee for the Defense of Democracy (Conade), which publicly called on the Minister of Government and the General Commander of the National Police to give all guarantees and security to the mobilization. Meanwhile, the former indigenous leader Felipe Quispe, the “Mallku”, affirmed that the different mobilizations carried out in the country demanding respect for the results of the referendum on February 21, 2016 already “have no meaning” because the inscription of the binomial politicians with a view to the primaries of January 27 and the general elections of October 2019 formalized the reelection of Evo Morales. “They have not respected the 21F, have not respected the expression of the people, the primaries. Is it in the Constitution? That was what Evo has created to his liking and measure, and as they are politicians, they have registered. I don’t see that marching nor claiming, has any point,” he said. This entry was posted in Bolivia, Politics, Social Unrest and tagged corruption in public office, demagogue, democracy in peril, MAS does more damage than good. Bookmark the permalink.